On a recent Friday morning, Michael Saylor appeared before a think-tank audience to cheerfully predict the end of the world. Newspapers and televisions? Obsolete in a smartphone-enhanced future. Banks and wallets? Ditto. Textbooks? About to “dematerialize.” Also doomed: Algebra teachers. "We need to eliminate every one of those algebra teacher jobs," Saylor said, waving his iPhone like a wand. "Instead of five hundred thousand average algebra teachers, we need one good algebra teacher. We need that teacher to create software, videotape themselves, answer questions, let your computer or the iPad teach algebra…The hallmark of any good technology is that it destroys jobs." Afterwards, when a fan of algebra teachers confronts him—“I think it sounds terrible!” she shrills—Saylor bears her tirade with a pitying look. It’s easy to believe he’s simply happy to have some attention again. As it happens, the last time Saylor was in the news, it also involved doom and destruction. The 2000 implosion of his software company, Microstrategy, was a classic dot-com bust story. Fabulously wealthy by age 30, Saylor had become known for lavish parties and youthful bluster: "I think my software is going to become so ubiquitous, so essential, that if it stops working there will be riots," he once said. His stock peaked at $333 per share. Then the SEC discovered an accounting error and the share price plummeted, famously losing Saylor $6 billion in a single day. Unlike fickle investors, though, Saylor stuck with Microstrategy, which sells data analytics tools to help companies squeeze inefficiencies out of their operations (Facebook and Starbucks are big clients). A decade later, he's back up to 3,000 employees worldwide and a respectable $562 million last year in revenue, launching new applications every quarter. And the raffish millionaire at its helm, still boyish at 47, is back in the news, flitting from a speech (National Press Club) to interview (Charlie Rose) to photo shoot (TIME, Fortune, the Georgetowner). Saylor has become the chief soothsayer of the internet industry's resurgence. His book, The Mobile Wave, which hit number seven on the New York Times’ bestseller list over the summer and number five on the Wall Street Journal’s, looks increasingly prescient as even web giants like Microsoft and Google stumble in switching to mobile devices. Outlets from Fox News to the Brookings Institution have called on him to explain how the future will look. But Saylor’s book book isn't just a survey of all the ways in which smartphones are taking over the world. It's also the manifesto of Web 2.0's collective id, projecting trend lines that continue ever upward, while proclaiming this revolution to be good and just. He's not wrong about the disruptive power of reducing massive industries to the size of an app. But the more interesting part of his thesis is how it captures the mentality of a generation of technologists, who believe that a smartphone is in fact a magic wand, ready to transform the life of anyone sensible enough to figure out how it works. The Mobile Wave was born in the Mediterranean, where Saylor took a few weeks off in the summer of 2010 to float on his 147-foot yacht and hammer out a draft. The book is written in the same blunt tone with which he speaks. It carries a scholarly air, frequently backgrounding observations with vignettes from Classical history. Saylor is an admirer of the Roman empire, and lately has been feeling more and more confident that America's imperial era is just beginning, propelled by dollars, English and dominant U.S. companies like Apple and Facebook. He scoffs at would-be rivals. Dubai? "A colony of America, twenty miles from Iran." The European Union? "Just an extension of the American cultural system." The same research has also led Saylor to believe that technology, rather than leading to the distribution of wealth around the country, is only magnifying the influence of America's most important cities: New York, Los Angeles, San Francisco and Washington (which Saylor, who grew up outside Dayton, Ohio, calls home). His evidence hews less to stats than to conversations with women he’s met. "They want to be surrounded by the Yankees," Saylor says. "They want to party with the professional basketball team." That, of course, is Saylor's experience of New York City. Just like going to Family Guy screenwriter Seth MacFarlane's Jazz-age theme party with the Hilton sisters and a 60-piece orchestra, which he narrates with a sense of wonder and delight, is his experience of L.A. 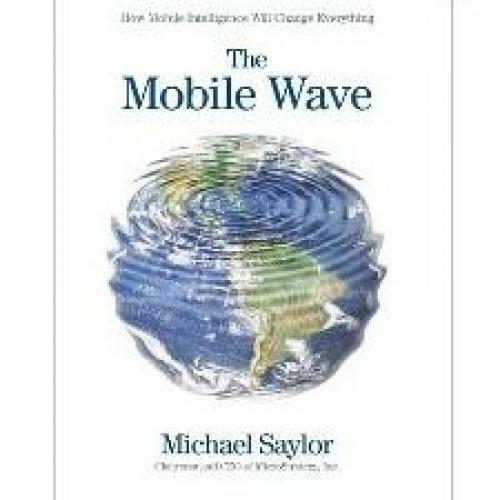 The company Saylor keeps helps explain the mind-set of The Mobile Wave. Even at his lowest point ten years ago, Saylor has long looked down on the world from the very top—he had to lay hundreds people off after Microstrategy tanked in 2000, but never feared for his own job. And even with a team of researchers to pile up information about the rest of the world, that tends to skew a guy's perspective. Take libraries, which Saylor figures are completely useless in the mobile era: he might not have realized that they're more full of computers than bookshelves these days, and young people still use them all the time. Or consumer data, which undergirds the revenue model for countless mobile innovations: Perhaps he hasn't talked with any of the majority of Americans who are deeply freaked out by having their every move tracked online. Saylor dismisses such squeamishness as paranoia. That won’t make it disappear. Still, for all his perambulations amidst the rarefied elite, Saylor devotes quite a bit of his book to the problems of its underclass. The mobile internet, he postulates, will solve nearly all of them. AIDS, cholera, and the misinformed confidence in witch doctors? They’ll vanish once the disease-stricken masses access scientific diagnoses on a smartphone. The skyrocketing cost of education? Back down to earth once lectures are distributed via tablet computers. Perhaps most stunningly, Saylor predicts complete economic and political freedom for those who never had much of it before. "The constraints on the world from my parents, their views, my economic circumstance, where I was born, the religious opinions of the person that controls my city, the political views of the mayor, the school board, or the president of my country: All those things will no longer be constraints on my mind or my capability," Saylor declared in his Brookings talk. "So I think it's a brilliant, wonderful, manifold future that we're looking at, and it will be fueled by goods and services that in essence are delivered to a billion people in a second for a penny." That’s pretty much the distillation of a mindset native to people who've made fortunes on the internet: All societal imperfections have a technological fix. The problem is, humanity—where parents still want teachers to watchdog their kids, where public health types still have to do in-person battle with tradition—gets in the way. Today's breed of techno-triumphalists—whom you can find fighting local regulators who want to kibosh a taxi-hailing app, or taking on the credit card industry with fee-less person-to-person transactions—consider disruption to be an inherent good. Google CEO Eric Schmidt fits the description, as do thousands of exhibitors at Valley startup conferences, where people predict that smartphones will replace the car. Naysayers are lumped in with the Luddites and defensive incumbents who stand to lose from change. But Saylor matters because he takes this well-worn thesis one step further. For him, lost jobs are a marker of success: Obsolete skills just hold civilization back, and surplus labor can be redeployed to push it forward. Letting Detroit fail, he figures, would’ve been an act of kindness. (Accordingly, Saylor’s donated $77,000 to Mitt Romney this cycle, though he calls himself nonpartisan). Certainly, it's never smart to bet against humankind's ability to replace jobs eliminated by technological upheaval. But the agricultural and industrial revolutions were accompanied by massive pain and dislocation. The United States is still suffering the aftereffects of the last one, and only beginning to confront the next, which will see millions of people losing gainful employment within this generation. One person's efficiency improvement is another's pink slip, after all, and the corporate executives who benefit from the savings likely won't reinvest all of them back into payroll.